All speakers regardless of type or format fall into one of two categories, active or passive, based on their relationship to the amplifier driving them. Passive speakers can be connected to virtually any amplifier through speaker wire attached to the speaker's binding posts. 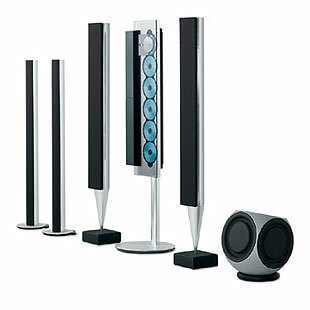 Active speakers, by contrast, feature a built-in amplifier that is an integral part of the speaker itself. Active speakers do not need nor do they make use of external amplifiers. Their input comes in the form of a low-level (line-level) signal passed along an interconnect cable originating at the preamplifier. Passive designs accept a speaker level signal that has been amplified enough to generate motion in the speaker's diaphragm and thus create sound waves. Ask Bang & Olufsen's principal designer David Lewis, what his dream is and he will tell you that it's to create the first truly invisible loudspeaker. It may never happen, but by aiming for the impossible, Bang & Olufsen over the years has already come a long way in producing a range of loudspeakers that are unique in their ability to combine the purest of sounds with the simplest of forms. By the laws of physics, loudspeakers must take up space, but the company chooses to shape them so their physical presence is less intrusive, and colour them so they compliment the surroundings in which they're placed. B&O continuously challenges existing technologies and invents new ones to ensure that a speaker's performance will never dictate its placement. In everything the company does, it never loses sight of the original aim: to allow the user to fill a home with sound and not equipment! You can't tell how a loudspeaker sounds from the way it looks. Most people want their loudspeakers to sound great but to take up the absolute minimum of space. Which is like having your cake and eating it. So how do you get a great sound out of a small cabinet? The answer is to build in amplifiers. When the loudspeaker and amplifier 'share the same home' they can be tailored to compensate for one another’s shortcomings. In other words, you can shape the sound the way you want it. Bang & Olufsen thinks it should be neutral which means that the sound that comes from its loudspeakers is exactly the sound that was intended by the artist who created it. Further, because human ears are going to listen to B&O's loudspeakers, the company uses human ears to measure them. The listening panel has the final say in that no new loudspeaker passes the test unless it sounds like the real thing. Bang & Olufsen has long championed the active speaker concept which is able to offer both acoustic and system advantages as well as great improvements on making often, ugly and out-of-place speakers fit into any décor, whether traditional or modern. Acoustically, the the use of separate amplifiers for each speaker driver - the woofer and the tweeter - maximises energy transfer to the individual drivers. In conjunction with a high-efficiency ported enclosure, this produces very high acoustic output levels over an extended frequency range, in a minimal physical volume. Since all amplifiers are contained in the speaker cabinets, no conventional external amplifiers are ever needed. This approach allows for considerable ease in placing Bang & Olufsen active speakers in any room. The active speaker approach - combined with innovative engineering - leads to a loudspeaker that is quite small in relation to its sonic output. This is extremely fortunate, since large, often 'boxy' speakers are often very unwelcome in a tastefully decorated room. BeoLab 8000 and BeoLab 6000 (among every other active speaker in the Bang & Olufsen range) are exemplary results of the Bang & Olufsen approach. Both speakers - with their highly polished aluminium surfaces and matching front covers - integrate into any room setting with utmost style. The refined exteriors of all Bang & Olufsen active loudspeakers barely suggest the complex engineering within. For acoustic engineers, every cubic centimetre of interior space represents a precious resource; to be used for the acoustic chamber if possible. This minimises bass extension and as a result, every mechanical element during speaker design is scrutinised to see if its size can be reduced. In the case of BeoLab 6000, this leads to integration of the woofer frame with its front mounting face, saving valuable space. It also allows a cone of slightly larger diameter and longer 'throw' for greater air-handling ability. During design of both these speakers, the tweeter (treble loudspeaker) was given a Neodymium magnet, which is more powerful for its size than a conventional magnet. The tweeter could then consume less space, making more room available for bass reproduction. And since the Neodymium magnet was smaller, it could be placed more completely inside the voice coil. During use, this virtually eliminates external magnetic effects of the tweeter. Such external magnetic fields can seriously interfere with the electron beam in the cathode ray tube that paints the TV picture, producing discoloured blemishes - which normally require bulky shielding to avoid. Woofers also require shielding, and even more so! But, again, space penalties made conventional shielding out of the question. Instead, an extra magnet was placed behind the normal, operative magnet. Opposing polarities between the two magnets cancel out external magnetic fields, completely eliminating any need for shielding. Thus, both BeoLab 8000 and Beolab 6000 speakers were designed from the very beginning to serve flawlessly as part of any modern Bang & Olufsen video and hi-fi system. Active speakers enjoy the benefit of tailoring an amplifier to a specific speaker and its particular drivers. For instance, an overly bright tweeter may be combined with an amplifier featuring a rolled-off treble generating a flatter response. The drivers can be mated to amplifiers that are particularly well suited to each drivers' unique characteristics and response patterns. Additionally, each driver may be powered by its own amplifier in an active design eliminating the need for crossovers. Conversely, crossovers used in active systems may be active themselves. Active crossovers, as opposed to passive designs, are powered. They tend to offer superior sound quality and are more flexible than their passive counterparts. Finally, active speakers do not require a user to purchase and find a place for separate amplifiers since they are built into the speakers. While active speakers enjoy certain benefits, they are also somewhat limiting. Due to their built-in amplifiers, active speakers must be placed near electrical outlets in order for the amplifier to be plugged in. Additionally, their amplifiers cannot be upgraded later for more power or a higher quality design, and by incorporating the amplifier into the speaker, a user cannot choose a particular amplifier and speaker based on their individual and combined merits. For these reasons, most speakers (other than subwoofers) are not active designs. Back in the 1980s Bang & Olufsen decided to define a new standard. Amplifiers were to be moved into the loudspeakers from their traditional position with the radio receiver. This planted the seed for the active loudspeaker. The first concept was the Penta loudspeaker. This was a very important move. Bang & Olufsen were first out with active loudspeakers for the home. There was quite simply no reference against which to analyse marketing work and there was a risk that people would not be willing to pay the extra cost of the loudspeakers, even though the customer simultaneously saved having to build amplifiers into an audio system. The challenge is emphasised by the fact that this was B&O's top-notch product in the loudspeaker range. However, right from the beginning, any scepticism was soon washed away. For the first five to six years no less than 20,000 a year were sold - and today almost 200,000 Penta Loudspeakers have left B&O. What few probably knew at that time was that Bang & Olufsen actually bet on two horses when the Penta loudspeaker was launched. Now that Penta is on its way out of production, the designers dare to reveal that they in fact had an alternative Penta ready without active loudspeakers should customers fail to buy. The version without an amplifier was launched as the Beovox Penta, but it did not sell well and after a while was withdrawn. The acoustics department headed by Villy Hansen had, however, tasted the sweet fruits of success with their structure which featured own production of acoustics, electronics and mechanics in a design from Lindinger-Lövy. This led to a major breakthrough with the active BeoLab 2500 loudspeakers belonging to Beosystem 2500 and BeoCenter 2300. The sound was so good that visitors presented with the system searched the premises to find the subwoofer that was not there. To their surprise, the great sound was produced by the small compact BeoLab 2500 loudspeakers. This was also the case for BeoLab 8000, BeoLab 6000 and BeoLab 4000. What's so great about aluminium? Aluminium makes the ideal material for loudspeaker cabinets. It’s light, rigid and if you shape it in one piece, you eliminate problems of dissonance from joints and corners, which are characteristic of wooden cabinets. The surfaces are polished until they shine like mirrors, so that they stand out from, and blend in with the colours that surround them at the same time. To protect the shine and ensure easy maintenance, the aluminium is anodised, which makes their unique coloured surfaces possible. Bang & Olufsen’s long term commitment to aluminium has made its anodising plant one of the most advanced in the world, especially regarding environmental concerns. The anodising plant in Struer, Denmark was built in 1992. It cost 25 million DKK, and is still the most advanced in the world, not least when it comes to the environment. Since anodised aluminium is as hard-wearing as it is decorative, anodising has replaced all the earlier heavy metal polluting galvanising processes at Bang & Olufsen. Which means goodbye to chromium, nickel, cadmium and zinc and hello to a better environment at work and play and for everyone in Struer. The anodising plant consists of 50 pools in a 50 metre long dip-line. Each pool contains 4,000 litres. The capacity is approximately 1.6 million items per week, and waste water is chemically cleaned before it’s led to the municipal purifying plant. The typical process consists of degreasing, matt pickling or high gloss polishing, scouring to remove alcalic residues, oxidisation, colour dyeing and sealing. A computer monitors the three cranes, so that dip times are kept down to fractions of a second. As a side benefit of the new plant, Bang & Olufsen have invented BeoSpray which is a highly advanced dyeing principle, enabling dye pigments to blend with any specific colour scheme in mind. So in more than one way, the future of Bang & Olufsen should look as clean and colourful as the outcome.